I drove out to Lake Allen to see what was going on and noticed a large bird flying over the water looking for something. It had its legs and talons extended. 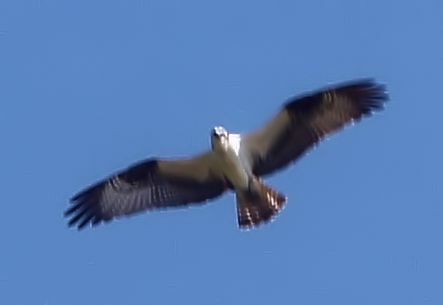 Upon closer examination, it was an osprey. I grabbed my camera to see if I could get a good shot. By the time I got it ready, the osprey was flying high. I managed to get a half-way decent shot of its under plumage – good enough for identification anyway. Ospreys are not unusual sights on the refuge, but they usually don’t stick around. There are at least four sub-species found throughout the world. The sub-species typically found in most of North America is Pandion haliaetus carolinensis (Gmelin, 1788). This entry was posted in Non-Refuge. Bookmark the permalink.